Rebates | Ellis County Firearms - Waxahachie, TX. Save big with Sig days, March 1, 2019 through May 31, 2019. Buy 320 for $50.00 voucher to use on Sigs website. 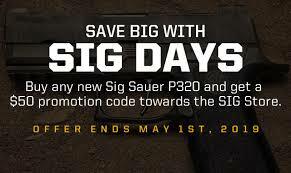 Buy any SIG SAUER P320 and receive a $50 promotion code via email towards the SIG store. Offer ends May 31st 2019 and must be used by July 31st 2019. Click “HERE” for a link to sig website. 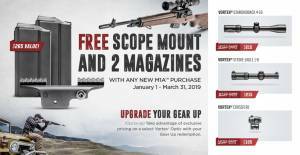 Springfield Gear up program, now through 1-31-19. receive 2 mags and Scope mount on M1A's. FN's Spring Bonus Gear Promotion. 3 free mags via rebate. Runs 2-1-19 through 3-31-19! Purchase a Five-Seven or FNX45 Tactical and get 3 more mags free via rebate (6total once rebate received). This rebate runs from 2-1-19 through 3-31-19, postmarked by 4-30-19. We will include a receipt with the weapon and we have included a link to FN’s site (click here) to read all the details. 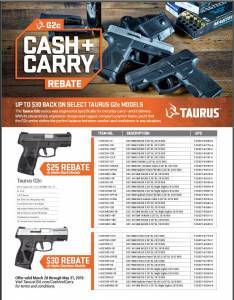 Buy any G2C, get $25.00 Rebate from Taurus. Runs March 28, 2019 through May 31, 2019. Starting 3-28-19, buy a new Taurus G2C and receive $25.00 back via Rebate. With this rebate, net price on a new Taurus 9mm w/ 2 mags to 185.00. Offer ends May 31st 2019 and rebate is good only on the G2C….G2S is excluded! Click “HERE” for a link to Taurus website.